Keep the rug rats entertained with these freebies. 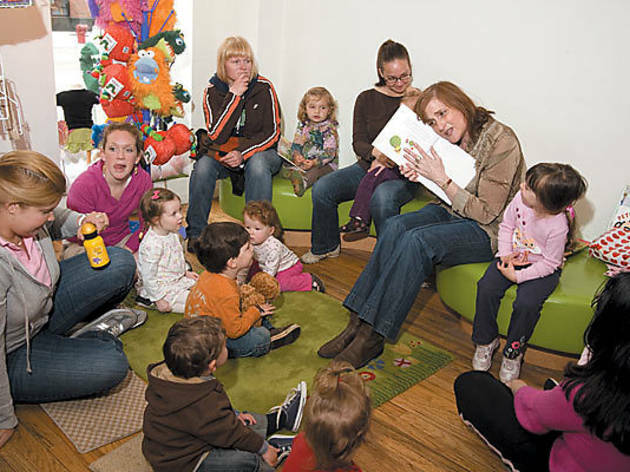 Photograph: Nicole Radja THIS AIN&rsquo;T A LIBRARY But stores such as Psychobaby and Book Cellar offer free kids&rsquo; readings. When my kids were small, we would make the rounds of neighborhood bookshops to take advantage of free story times. 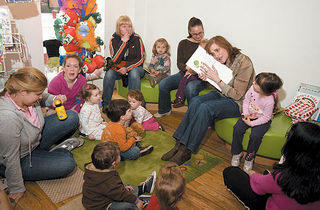 We especially loved the lively readings by the Storybook Mom (a.k.a. Nili Yellin), whose weekly stops these days include Psychobaby (1630 N Damen Ave, 773-772-2815) Wednesdays at 10:30am and the Book Cellar (4736 N Lincoln Ave, 773-293-2665) Fridays at 11am. Hidden cost We often liked the stories so much we wanted to buy the books, and I felt guilty if I didn’t make an occasional purchase. When they started to read on their own, I got them Chicago Public Library cards, and we discovered we could do a lot more than just borrow books. We found a few branches where we could check out fishing poles, and we take out Kraft Great Kids Museum Passports, which give our family of four a week of free access to lots of big-name museums and cultural institutions (the Art Institute, the Shedd, Museum of Science and Industry and more). Hidden cost There’s usually a waiting list for these golden tickets, making it difficult to plan ahead. Plus, we’re often elbow-to-elbow in maddening crowds. We’re frequent spectators at lots of league, intramural and pickup games. We watch rugby matches at our neighborhood park and soccer at the lakefront. Once in a while, we hit a skate park (two faves: Wilson Skate Park at Wilson Avenue and Lake Shore Drive, and the new, covered Logan Square Skate Park at 2430 West Logan Boulevard) to watch wanna-be Tony Hawks. We do the same thing to check out new music, sometimes visiting the Old Town School of Folk Music (4544 N Lincoln Ave, 773-728-6000, oldtownschool.org) to watch the free student-ensemble performances. Check the school’s website for a schedule. Hidden cost The kids want to try every sport and instrument they discover, meaning pricey equipment purchases later on. One of our favorite recent discoveries is Northwestern University’s Dearborn Observatory (2131 Tech Dr, Evanston, 847-491-7650), where you can stargaze free every Friday night using its massive telescope (and a ladder). You can reserve private viewing time just for your family from 9–10pm or drop in for public viewing from 10–11pm. Hidden cost Astronomy students running the show may not have their act together, and visiting astronomy geeks can hog viewing time, meaning you pay the price of sitting around until you get your turn.